George Graham reviews Abbie Gardner's "Hope"
In the folk world there have recently been some groups formed by members who have careers as individual artists, and they end up dividing their time between the group and their solo work. Cry, Cry, Cry and more recently Red Horse are some examples. This week, we have a new recording by one of the members of the group Red Molly, Abbie Gardner, whose CD is called Hope. New York-based Red Molly was formed in 2004 and have released three CDs showing some bluegrass influence. Abbie Gardner is the Dobro player and one of the voices in Red Molly. She has lengthy background in music. He father, Herb Gardner is a jazz pianist and trombonist, and with music around the house, Ms. Gardner naturally absorbed it. Her bio says that he went to a bluegrass festival at age three. Growing up, she studied the classical flute, but her interest in folk and bluegrass led her to take up the Dobro, which became her main instrument. On her hew CD, she played several resonator-type guitars or slide-style, from a National Steel to Dobro to a lap steel. But this is mainly a singer-songwriter record, and she does both with lots of class. She creates songs that range from upbeat and celebratory to melancholy to cautionary, with the styles ranging from blues to ballads. There are also a couple of cover songs, a traditional Gospel tune and one from the Big Band days, and there's one rather funky acoustic instrumental. Apart from that instrumental, Ms. Gardner's vocals are first rate, and the CD shows her versatility. The supporting musicians on the CD include her father Herb Gardner on piano, her sister Sarah Gardner on organ, plus Chris Aiken on acoustic bass throughout, and drummer Ben Wittman, a fairly ubiquitous studio drummer who has also produced a number of albums by contemporary folkies. Fellow Red Molly member Laurie MacAlister does some backing vocals here and there, as does Pat Wictor, another folk-oriented singer-songwriter who's a slide guitarist. Hope is marked by a nice sense of musical eclecticism, from bluesy to bluegrass-influenced. Ms. Gardner adds a slightly bluesy twist to the cover songs she reinterprets. 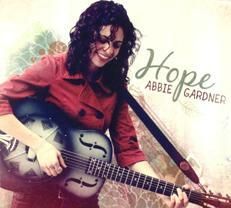 Abby Gardner's new CD Hope, her third release on her own, apart from the recordings with Red Molly, is a satisfying, though, at 37 minutes, a somewhat short set of music. Ms. Gardner's use of resonator guitars gives the CD a distinctive sound, allowing her to span bluegrass to blues. She's also a fine vocalist and thoughtful lyricist. The supporting musicians on the CD, including her father and sister, add much to the recording though their tasteful and understated work. The CD also gets a good grade from me for audio quality. The sound is warm and free from unnecessary studio effects. The dynamic range is also decent by contemporary standards. Abbie Gardner continues performing and touring with Red Molly, and apparently will also continue to do some performances of jazz standards with her father. This solo album provides a nice spotlight to a further facet of a versatile artist.